A few years ago I ate a slice of cake in Bellagio that had the same flavor profile, and I was determined to duplicate it at home. I finally got around to it recently, and while I’m not sure it’s exactly the same, it’s really, really good, especially if you’re a dark chocolate and coconut lover, as I am. 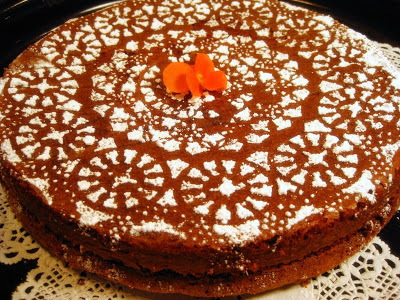 I made two of the cakes, one half the size of the original one, since I was serving the larger one to my Italian chit-chat group and wanted a second, small one to serve guests after dinner the following night. A bit of gold leaf on top makes a nice decoration, but so would a simple dollop of whipped cream. 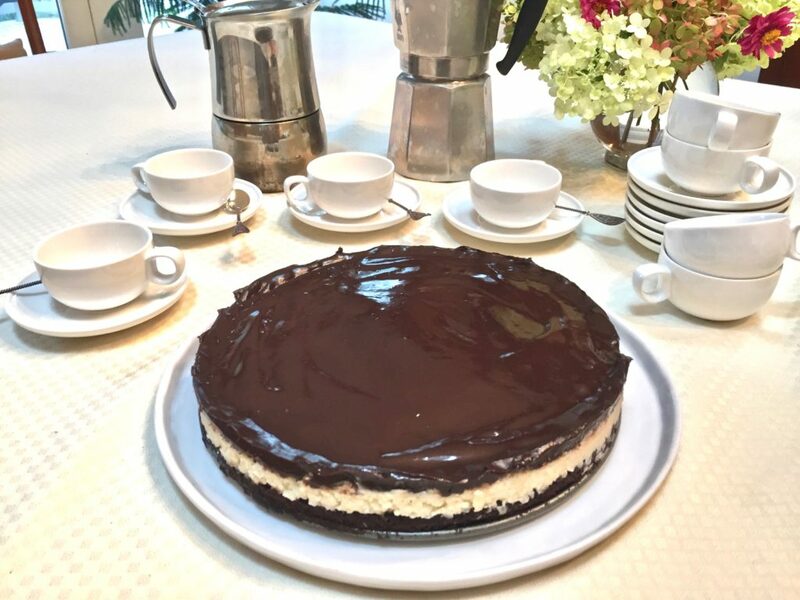 If you’re making just one tart according to the recipe below, the coconut layer will be thicker than in the photos above, since I made 1 1/2 times the amount of the chocolate cake part, but I spread the coconut quantity over the two cakes (the larger and the smaller version.) I hope that makes sense to you. If you’re still confused, send me an email and I’ll try to explain it better. 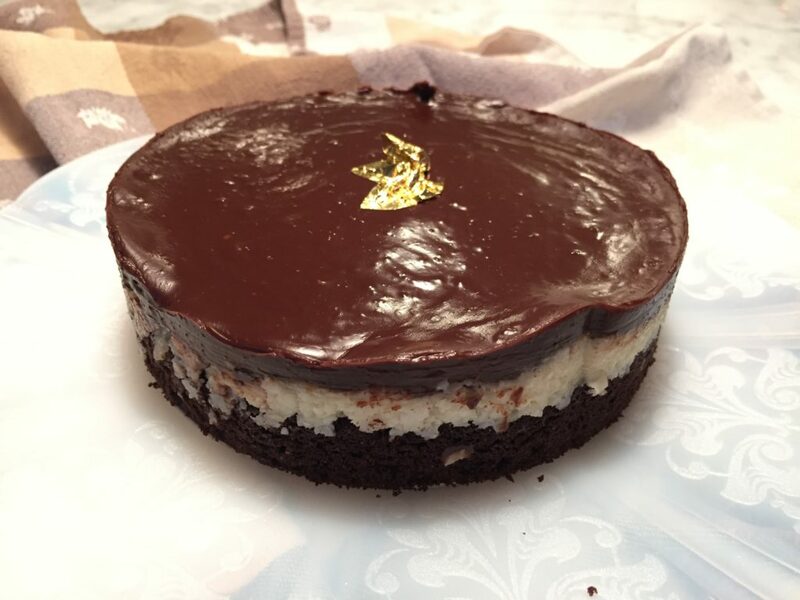 Just a word of caution – the chocolate ganache will not stay this glossy if you refrigerate the cake. 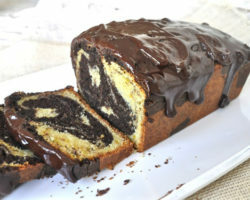 So if you want to serve it with that sheen but want to make the cake ahead of time — just make the cake without the ganache and place it in the refrigerator (still in the springform pan), then a few hours before you want to serve it, remove from the refrigerator and top it with the ganache while in the springform pan. Let it sit for 5-10 minutes for the ganache to solidify, then release the side of the springform pan. Don’t refrigerate it again or you’ll lose the sheen. Enjoy! It’s almost like eating a chocolate covered, coconut-cream Easter egg. 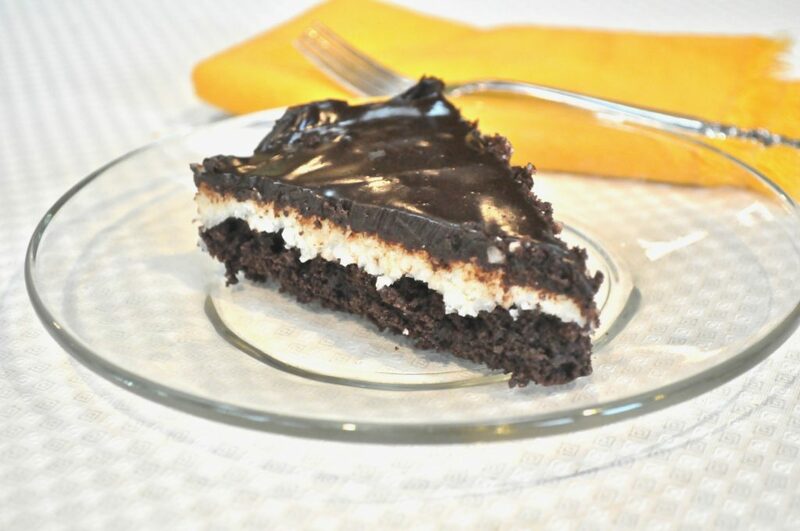 A rich, brownie-like cake, with a coconut layer and a topping of chocolate ganache. ½ cup unsalted butter melted. ⅓ cup unsweetened cocoa powder. Mix sugar and melted butter, with a wooden spoon. Add the rest of the ingredients and mix well. 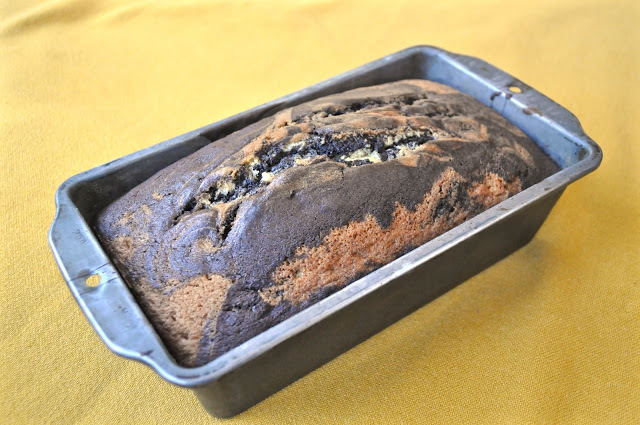 Pour into a greased 9 inch springform pan and bake for 25 minutes at 350 degrees. Put the coconut in a food processor and shred into small bits. When cake is cooled, spread coconut layer on top. It will be very dense. Heat cream and remove from heat. Let sit for a few minutes then stir to blend. Pour chocolate over coconut layer a couple of hours before you serve it and leave it out at room temperature in order to keep the chocolate glossy. You can refrigerate it if you want, but it will lose some of its gloss. Remove the ring from the springform pan, and serve. 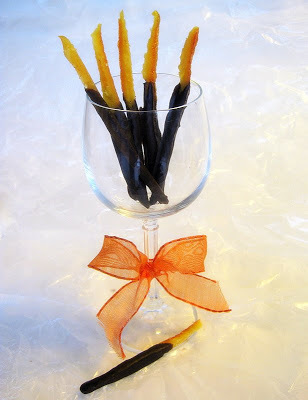 Looking for an easy treat for Valentine’s Day? 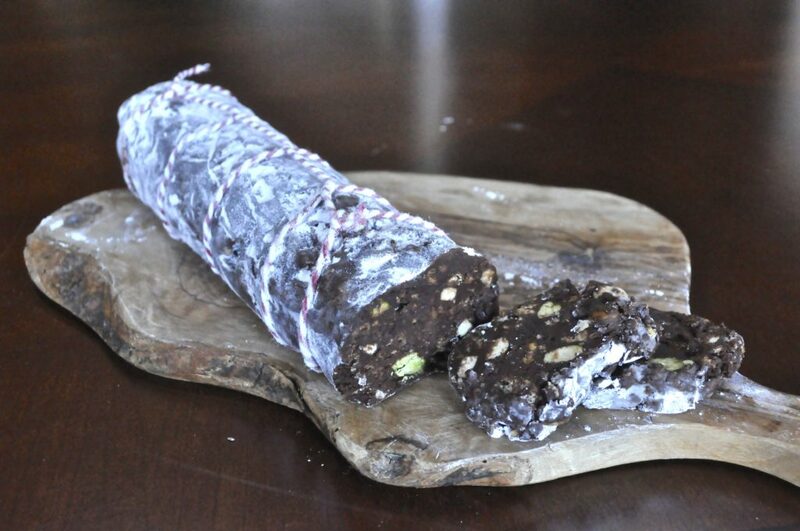 You’ve got plenty of time to make this chocolate “salami” that requires no cooking, and comes together lickety-split, using ingredients you may already have in the house. 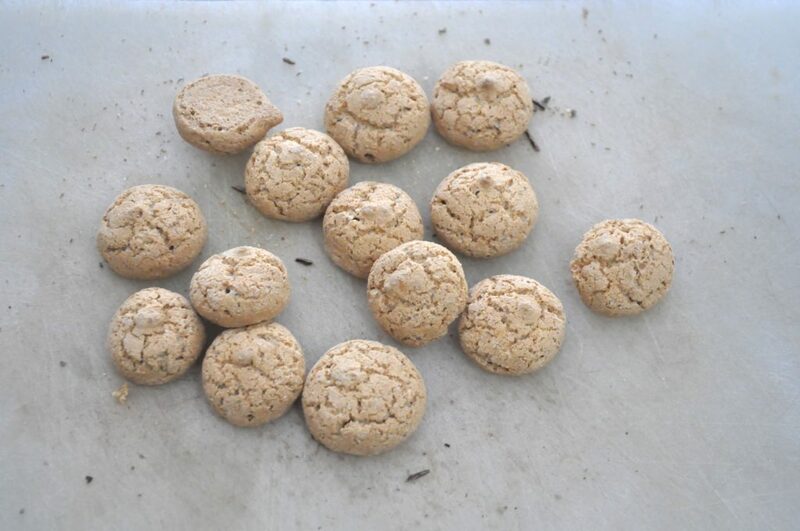 I used amaretti cookies to simulate the bits of fat running through a real salami, but you could use graham crackers, digestive biscuits or even chocolate chip cookies. 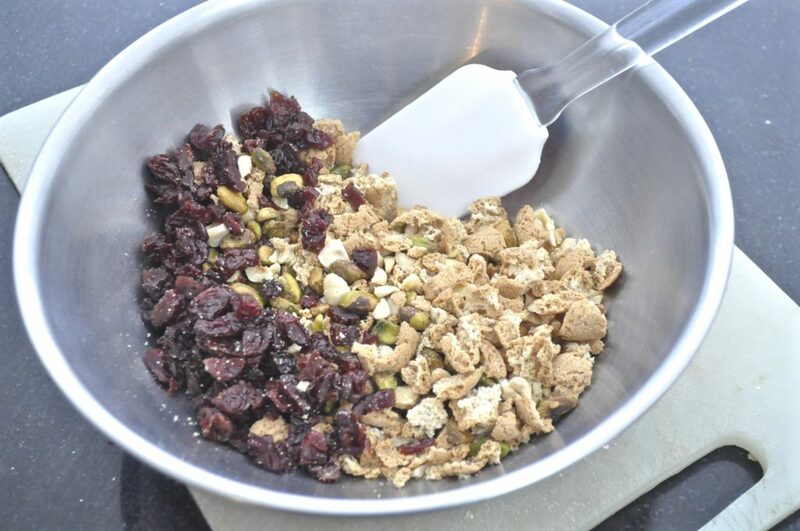 Crumple them up and mix them in a bowl with nuts and dried fruit of your choice. 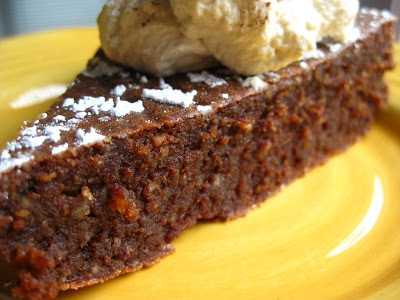 I used pistachios, hazelnuts and dried cherries and it was a winning combination. 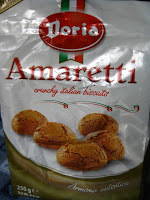 But if you like almonds or walnuts instead, or dried cranberries or dried apricots, those would be delicious too. Melt some chocolate. You could use milk chocolate, but I prefer dark chocolate and used Hershey’s Special Dark chocolate. If you want to spring for a more expensive chocolate, go for it, but Hershey’s Special Dark won a blind taste test on America’s Test Kitchen years ago and I’ve been using it since then for nearly all my recipes requiring dark chocolate. It costs a lot less than the specialty brands, so that’s a nice plus too. Mix the melted chocolate with all the above ingredients and add some liqueur. It’s not strictly necessary, but it does add another layer of flavor. 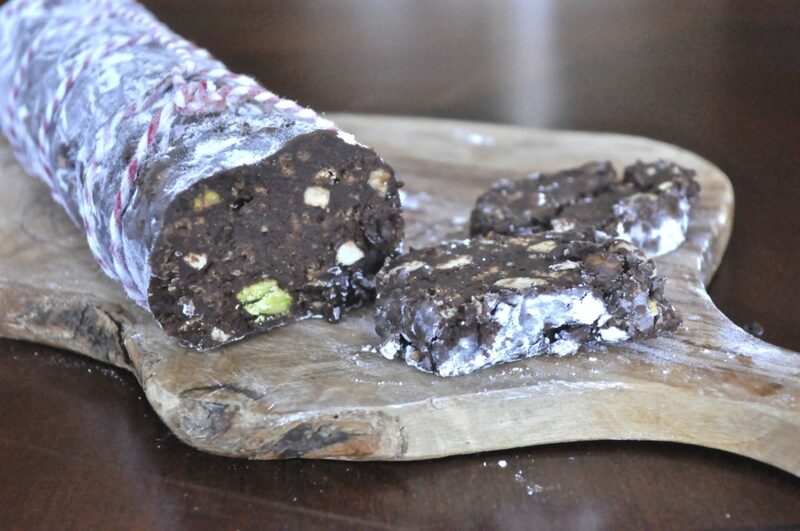 Some recipes for chocolate salami ask you to add raw eggs, but I thought I’d try it without, since so many people have health concerns about using raw eggs in recipes. The risk is miniscule, but still, why take any risk, I thought. 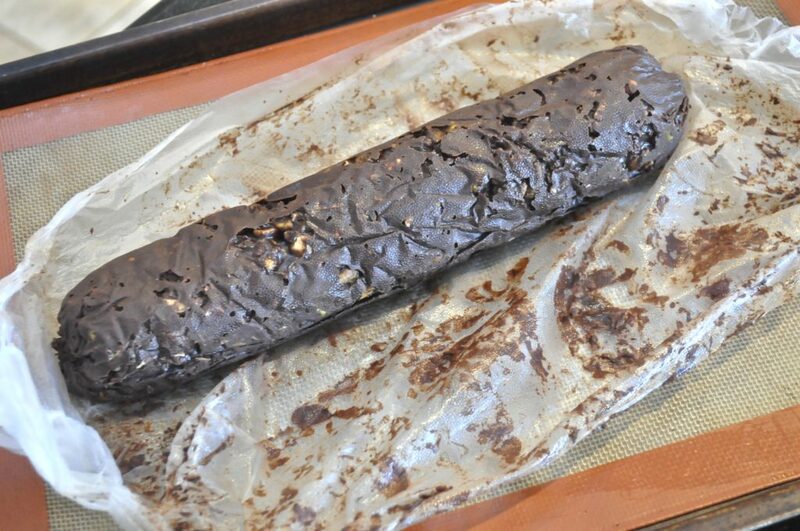 Next, dish out the chocolate into a log shape. It will be too soft to shape at this point, so put it in the refrigerator for about 20 minutes, or until it firms. 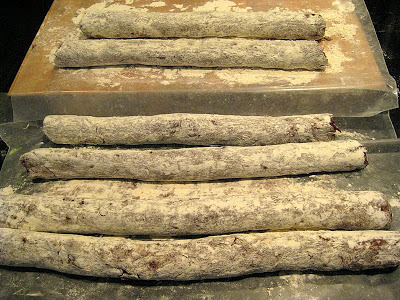 Then roll into confectioner’s sugar to simulate the white “bloom” that appears on aged salami. 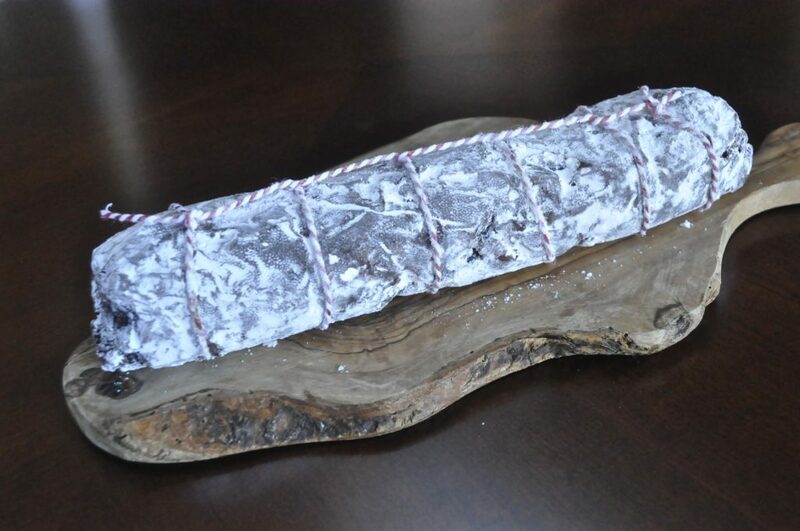 If you have some butcher’s string, tie it across the chocolate salami to mimic a real salami. Slice it and watch the surprise when people realize it’s not really cured meat, but a delightful chocolate treat. Happy Valentine’s Day. When it is nearly melted, add the butter in pieces and melt it. Chop the amaretti cookies and nuts (I left the pistachios whole) and put in a bowl with the cherries. 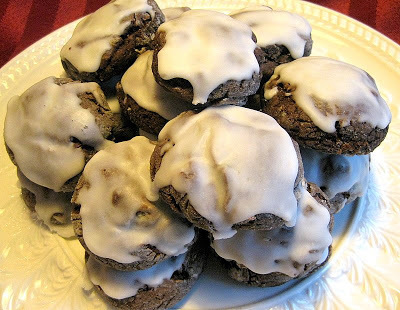 Pour the melted chocolate over the nuts and cookies and add the liqueur. Place the bowl in the refrigerator for about 15-20 minutes until it firms up, but keep checking because you don't want it so firm that it's too hard to roll. 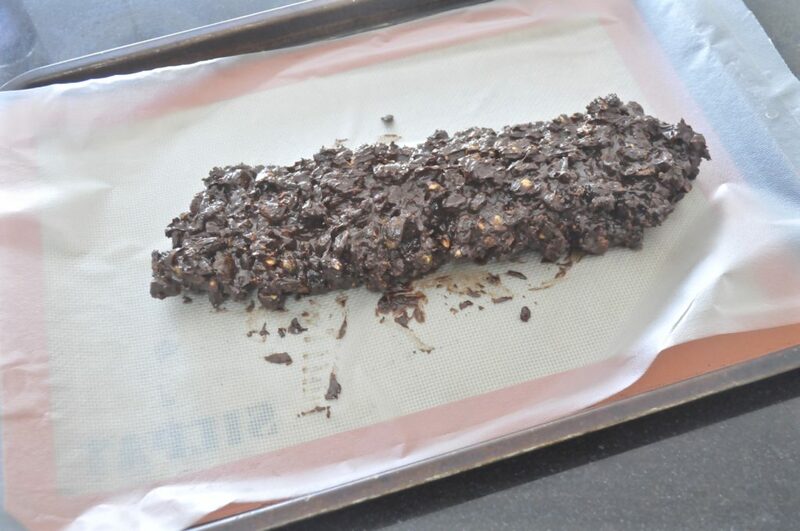 Dish out the chocolate onto a piece of plastic or waxed paper. 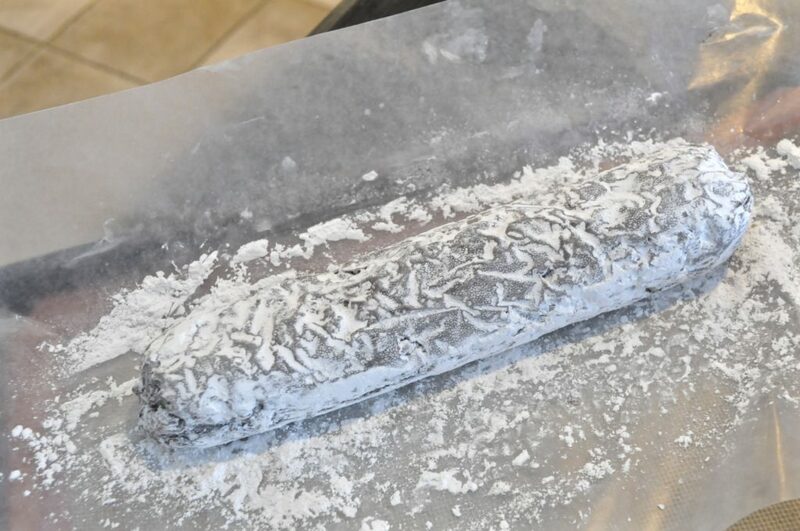 Roll into a log and place it back in the refrigerator until very firm, maybe an hour or so. When it's firm, sprinkle powdered sugar all over. Tie up with butcher's string if desired, and slice to serve. I’ve been trying to stay away from baking all summer (that doesn’t mean I haven’t had my share of ice cream however). But when a new cookbook arrived and I started flipping through it, my resolve quickly dissolved. 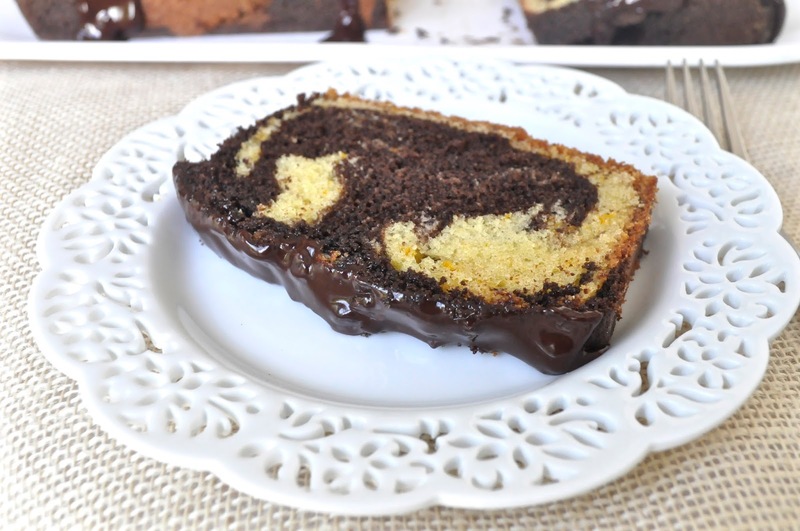 The next day I baked this cake — one of the most delicious cakes I’ve had in a long time, with rich chocolate and subtle orange flavor, a tender crumb and a luscious chocolate ganache topping. Fortunately, later in the day I was meeting some board members from an Italian cultural institution I’m part of, who offered to lend with our annual mailing. I lure them each year by bringing food, and they happily stuffed envelopes and slapped on stamps, sustained by this cake from Jamie Schler’s new cookbook, “Orange Appeal.” Several of them took slices home too, leaving me with just enough cake to give my dad the next day. 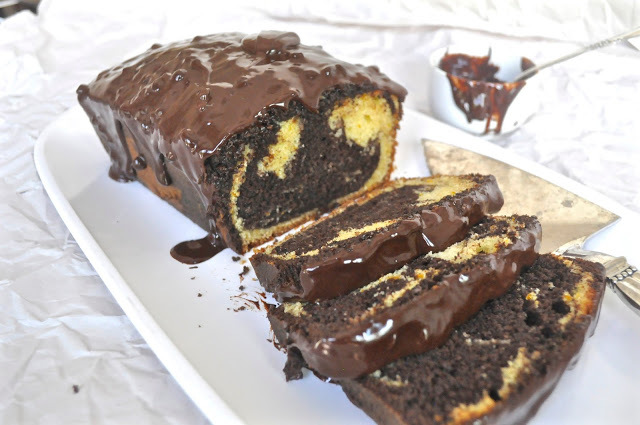 It’s definitely a cake that will make appearance after appearance in my kitchen. 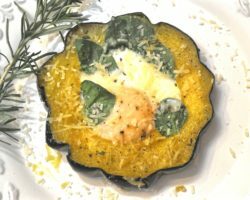 The photos are beautiful too, by Ilva Beretta, who also collaborated for two years with Jamie on the blog, Plated Stories. 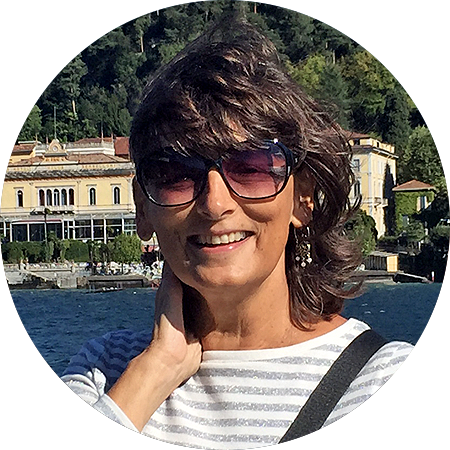 Jamie now lives in Chinon, France, from which she writes the blog “Life’s A Feast,” and where she also runs a hotel (Hotel Diderot) — a place I’m longing to visit at some point. With her busy life, I don’t know how she found time to write a cookbook, but it contains a plethora of recipes that include oranges in some form or other — not unexpected for someone who grew up in Florida. I’ve made my share of candied oranges, but never tried orange powder, orange sugar, or orange salt. But with Jamie’s instructions from the book, they’ll be on my to-do list as soon as citrus season rolls in here in the Northeast U.S. The book contains many savory recipes as well as sweet ones, and I’m really looking forward to trying the sweet-and-sour marmalade-glazed oven baked chicken next. I’ve also got my eyes fixed on the glazed blood orange yogurt loaf cake and many others too, but they’ll have to wait until I make this chocolate orange marble loaf cake again, this time for my husband to try. After you mix the batter, it gets divided in two parts. One is for the chocolate mixture, and into the other go the orange peel and orange juice. The raw batter was so delicious I had to restrain myself from licking too much off the spatula. I swirled the chocolate batter into the white batter using a knife. The kitchen smells divine while it’s baking. Let it rest for a few minutes before removing it form the pan. 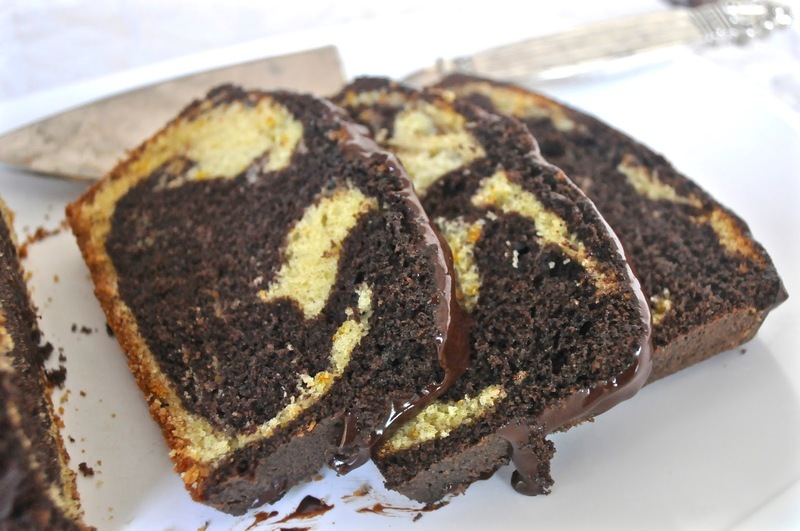 The recipe says the chocolate glaze is optional, but for me it was an absolute necessity (especially if you’re using a Lindt chocolate bar that contains orange bits). It’s a good thing I had a meeting to take this to, or I’d have eaten half the cake myself. I did have to eat one slice before taking it to the meeting (you know, quality control and all that stuff). 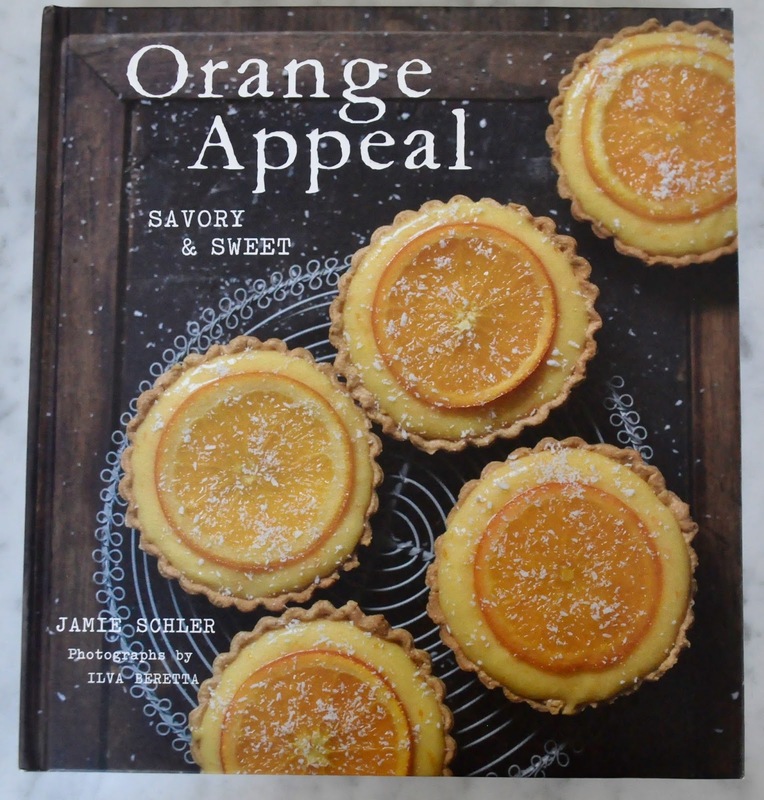 Now I’d like to offer one of you a free copy of “Orange Appeal” so you can try this and all the other recipes in the book. Just leave a comment at the bottom of the blog post (not in email), and a way for me to contact you if your name is chosen. 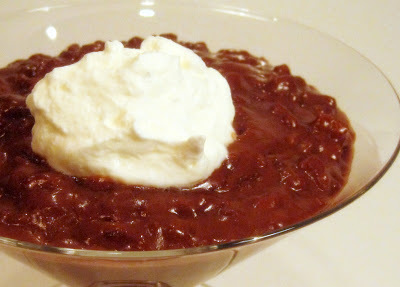 2 packed tablespoons (18 g) unsweetened cocoa powderPreheat oven to 350 degrees F (180 degrees C). Butter a standard 9 x 5 x 2 1/2 inch (23 x 13 x 6 1/2 cm) or 8 cup 2 l) loaf pan; fit a piece of parchment paper in the bottom. Stir together the flour, baking powder, and salt in a small bowl. 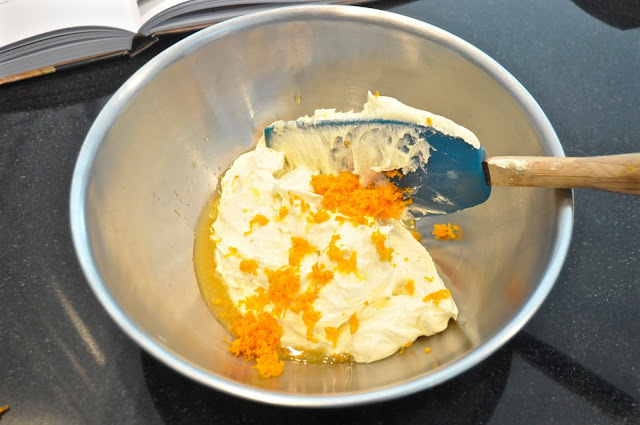 Cream the butter and sugar together in a large mixing bowl, beating until light and fluffy. Beat in the eggs, 1 at a time, and then beat in the oil. Beat in the flour mixture until blended, scraping down the sides of the bowl. Divide the batter evenly between 2 bowls. Beat the zest and juice into 1 portion of the batter, and the milk, vanilla and cocoa into the other portion of batter until well-blended. Spoon large dollops of each mixture, alternating the batters, into the prepared loaf pan. 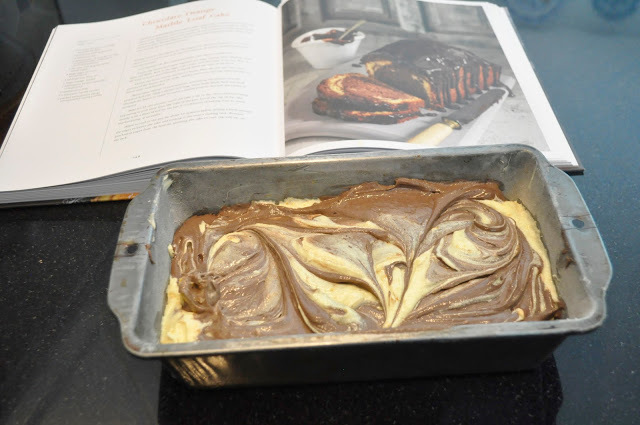 Drag a skewer or a long, sharp knife blade back and forth through the batter in swirls to create a marble pattern. Smooth the surface if necessary. Bake for 55-60 minutes, until the cake is set in the center and just barely beginning to pull away from the sides of the pan. Cover the top of the cake loosely with a sheet of foil for the last 5-10 minutes of baking time to over over browning, if necessary. Allow to cool in pan for about 10 minutes before sliding a knife around the edges to loosen the cake and turning it out onto a cooling rack. Remove parchment paper from the bottom, allowing the cake to cool, top side up, on the rack. 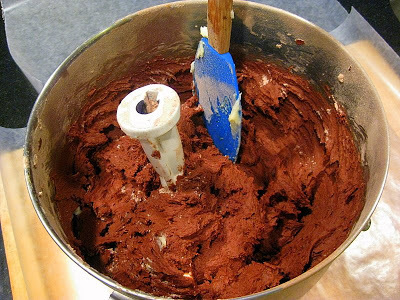 1/2 cup (125 ml) heavy creamPlace the chocolate into a medium heatproof mixing bowl. 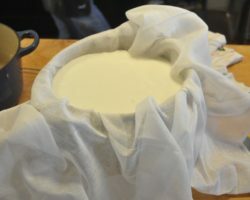 Slowly heat the cream in a small saucepan until it comes just to the boiling point. 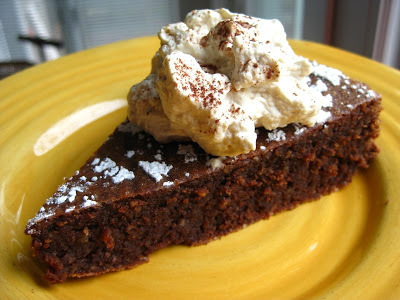 Pour the cream immediately over the chocolate and stir until it is smooth and creamy. 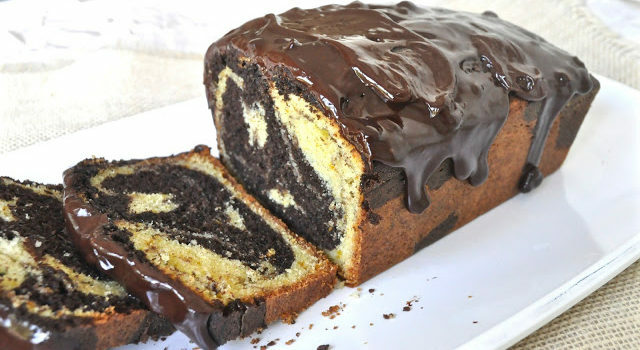 Allow the ganache to cool to room temperature, stirring occasionally, until thickened to a drizzling consistency before spooning over the sponge cake. This week we met at a chocolate factory. And it was bliss. 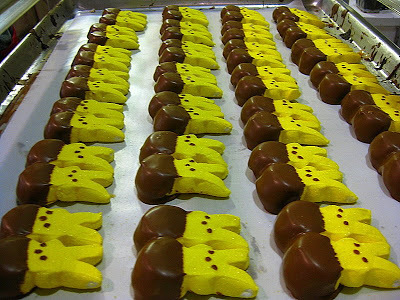 The above photo is of some marshmallow “peeps” after a dip in milk chocolate. 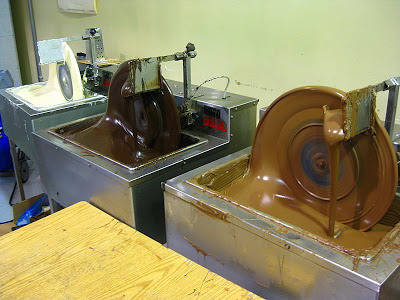 Here is a photo of the dipping machines – white, dark and milk chocolate. First, she let us choose some fruit and dip it into those chocolate tanks. Some of us chose big luscious strawberries. Some of us chose big fat orange segments. Some of us chose big luscious strawberries and then went back for big fat orange segments. Dipped in dark chocolate. Yum. Excuse me while I savor the moment. But that’s not all. We kept touring the place and tasting as we went along. Solid chocolate, potato chips dipped in chocolate, oreos dipped in chocolate, you name it. You like milk or white chocolate rather than dark? Chris was very accommodating and gave us samples of whatever flavor we liked. Of course, we all shopped and shopped later on in the outlet store next to the factory. In addition to their three retail outlets, in Windsor, N.J., Cherry Hill, N.J. and Manalapan, N.J., the company sells to lots of stores across the country, including upscale places like Barneys in New York. Many of their products are also sold under private labels. Their busiest time is Christmas, when lots of corporate clients place orders. 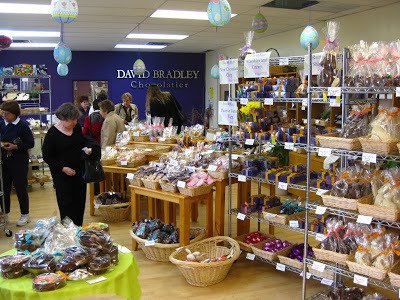 But they’re pretty busy right now too, with bunnies and eggs and other Easter items taking priority. 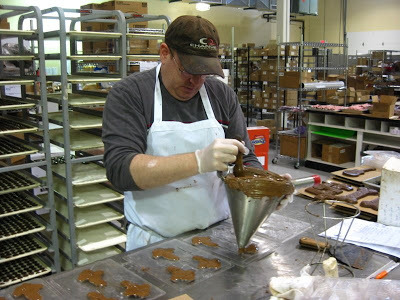 Chris said that they go through about 2500 pounds of chocolate a week. Everything is made to order and made fresh daily. “We are working a little harder, but it’s going to taste better,” Chris said. Their stuff doesn’t go to the big box stores where you don’t know how long ago it was made. 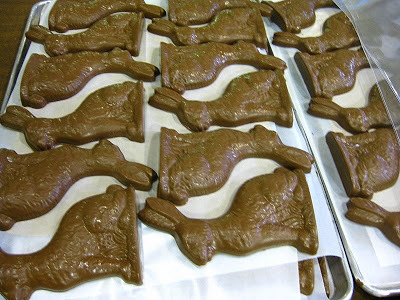 If you’re buying candy for Easter from their shelves, you know it was made within a day or two. 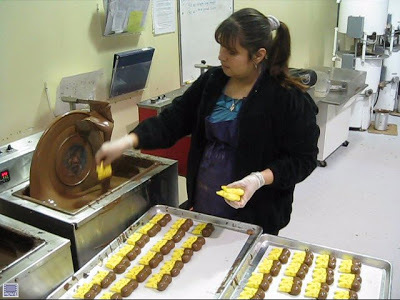 Here’s one of the workers filling the molds by hand. 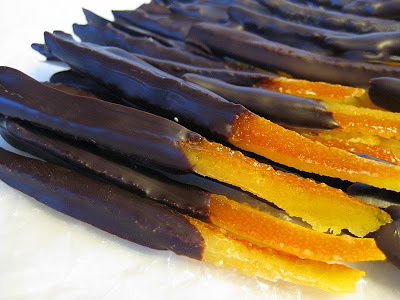 Even if you thought you didn’t like candied orange peel, wait till you try this one. 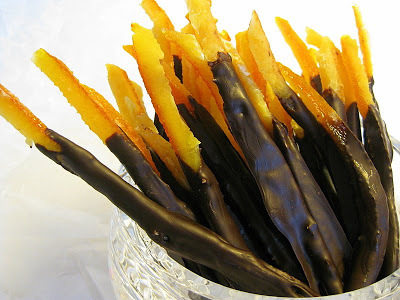 This is not your grandmother’s candied fruit. 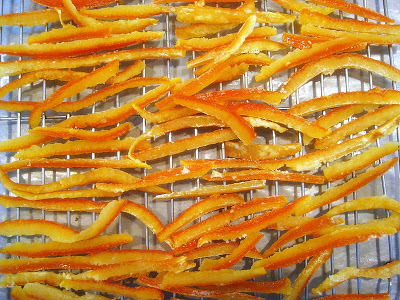 Last year I bought some candied orange peel to use in a Pastiera, an Italian Easter dessert that I’ll be posting in the next couple of days. This year I came across a terrific post on “Use Real Butter,” that outlined how to make the confection, so I thought I’d give it a try. It wasn’t really that difficult and it is so superior to anything you can buy. 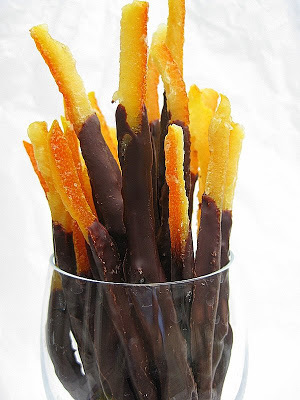 I’ll never go back to store bought candied orange peel again and I’ll bet you won’t either. Dip these strips into chocolate and you’ve got a first-class gift that will really impress your friends. 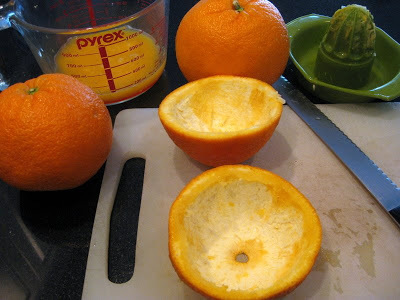 Cut the oranges in half and squeeze out all the juice. Scrape out all the pulp, but leave the white pith. I use a grapefruit spoon and it works great. 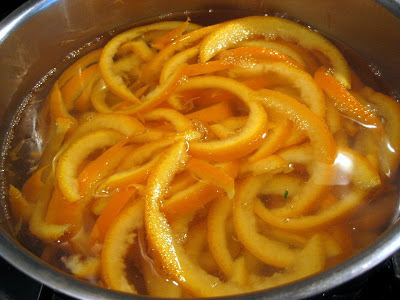 Every recipe that calls for orange rind always says to remove the pith because it’s bitter – and it is. But for this recipe, if you don’t leave the pith, you’ll end up with a puny peel after all the sugaring. In order to counter the bitter taste, you need to boil the peels first. I boiled mine four times as you’ll see below. 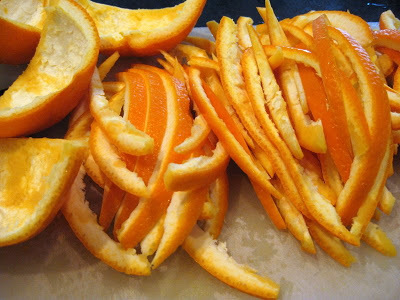 Using a sharp knife or pizza cutter, cut the orange halves into strips. Place the strips in a large pot and cover with cold water. Let the water come to a boil and cook for five minutes. Drain. Repeat three more times. Cook sugar and water and cook at high heat until temperature reaches 230 degrees. Add peels and lower temperature to a simmer. Cook until peels are translucent. It may take as little as 1/2 hour or as long as an hour and a half, depending on your altitude. Remove peels and drain on metal cake racks. They will be sticky so work quickly. If not dipping in chocolate, you may want to roll in sugar to make them even more crystalline-like, however I omitted this step. 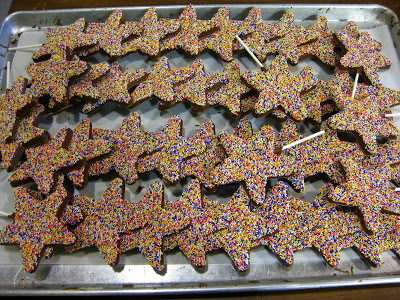 Even without the extra sugar, they tasted plenty sweet and looked great. Let the orange strips dry. It took at least two days for mine to dry thoroughly enough since it’s been rainy and humid here the last couple of days. Depending on the weather when you make these, it could take less or more time. 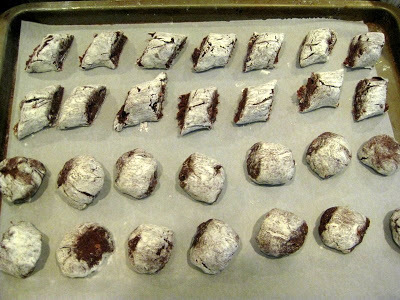 Dip into tempered chocolate and place on waxed paper or parchment paper until dry. 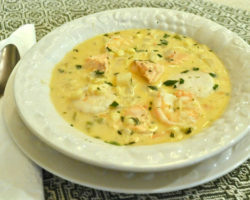 This is so good and astonishingly easy to make, it’s a wonder I don’t make this more often. Oh yea, that’s why I don’t make it more often. It does make a quick and beautiful gift for any occasion though. 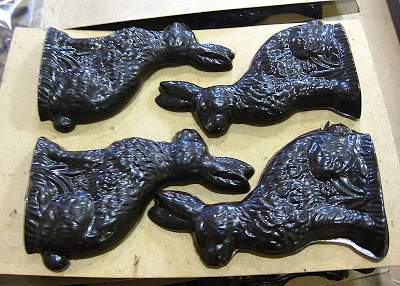 Use a good quality chocolate, but that doesn’t necessarily mean it has to be expensive. I recently discovered a delicious bittersweet chocolate at Trader Joe’s that’s a real bargain. It’s called “Pound Plus,” because it weights 17.6 ounces, and it costs only $3.99. You can use milk chocolate if you prefer, or even white chocolate if you’re so inclined. I sprinkled chopped-up apricots, dried cranberries and almonds on top, but the choice is limited only by your imagination. I added a bit of orange oil to the chocolate to give it a more complex flavor, but that’s completely optional. Line a cookie sheet with parchment paper. 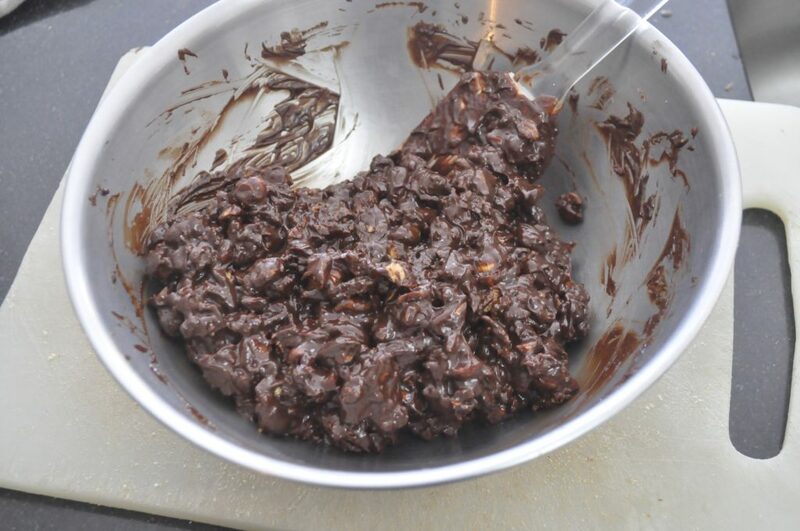 Melt chocolate on top of a double boiler and add a quarter teaspoon of orange oil (NOT orange extract). Spread with a spatula over the parchment. 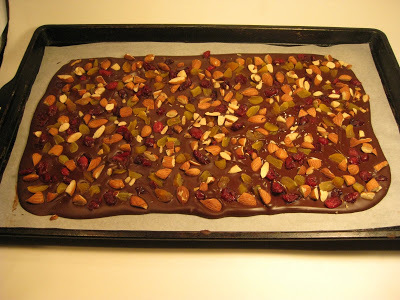 Gently press chopped almonds, apricots and dried cranberries on the surface. 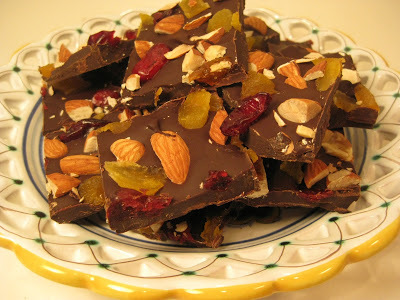 Place in a cool room or in the refrigerator until chocolate has hardened. Cut into chunks with a heavy knife. 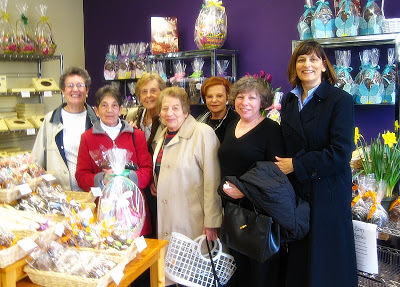 These chocolate treats are one of the many specialties of the region of Italy called Abruzzo. We spent a week there, as part of a recent trip to Italy, visiting my husband’s relatives who live in a small village near the Adriatic coast. While there, we feasted each day at pranzo (lunch) and cena (dinner), moving from one cousin’s house to another, soaking up the warmth, the hospitality and the good food. 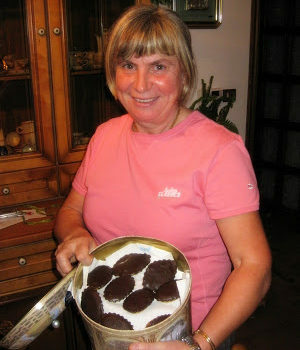 Giovanna, the cousin who is pictured here, cooked up a batch of these cookies the night before we left for us to take back to the U.S. 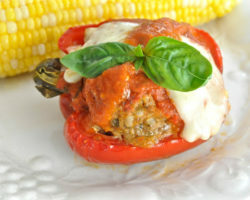 Her culinary skills are well-known among her family and neighbors in Italy. Since returning to the U.S., I’ve been sharing her bocconotti with friends and relatives here, so her reputation has spread to the U.S. as well. Giovanna gave me her recipe, which uses lard in the dough, but I have adapted it with butter. She also told me she uses a mixture of liqueurs in the filling — “Whatever I have in the house,” she said. Feel free to do the same, or focus on one particular flavor. You could use rum, or brandy, or an orange-flavored liqueur, for example. Or do as Giovanna does and combine several. They keep for a month, she said, as long as they are in a covered tin or container. 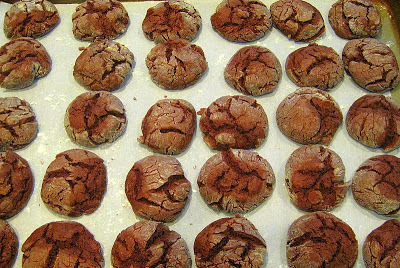 Even though the recipe makes about four dozen bocconotti, you might have trouble keeping them for that long! Cream butter and sugar in a mixer. Add egg yolks, one at a time, blending well. Add flour and mix until it forms a soft dough. Break off small portions and roll out to the thickness of pie crust. 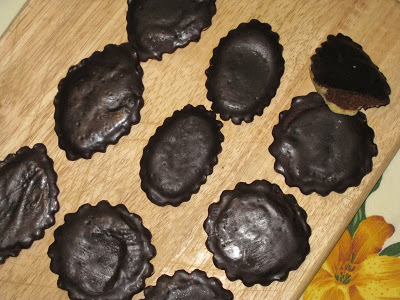 Cut and fit into small metal tart tins. Put the chocolate into a bowl and pour the hot coffee over it, stirring until melted and smooth. Mix in the almonds, sugar, cinnamon, lemon, egg yolks and liqueur. Fold in beaten egg whites. Pour into the tart shells. 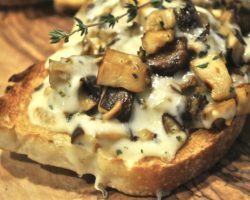 Place on a cookie sheet and bake in a 375 degree oven for about 20 minutes. When cool, melt about 4 ounces chocolate in a bowl with 1 T. oil. Spread over the cooled cookies.